FIRST (For Inspiration and Recognition of Science and Technology) is devoted to helping young people discover and develop a passion for science, engineering, technology, and math. Founded in 1989 by inventor Dean Kamen, the 2016-2017 FIRSTseason is expected to attract close to 460,000 youth and more than 230,000 mentors, coaches, and volunteers from 60+ countries. The annual programs culminate in an international robotics competition and celebration where teams win recognition, gain self-confidence, develop people and life skills, make new friends, and perhaps discover an unforeseen career path. 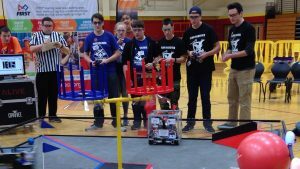 Dubbed a “Varsity Sports for the Mind,” FIRSTRobotics Competition combines the excitement of sport with the rigors of science and technology. Under strict rules, limited resources, and time limits, teams of 25 students or more are challenged to raise funds, design a team brand, hone teamwork skills, and build and program a robot to perform prescribed tasks again a field of competitors. It’s as close to real-world engineering as a student can get. Professional mentors volunteer their time and talents to guide each team. Earn a place in the World Championships. Qualify for over $81 million in college scholarships. Visit our map to see where all of our Indiana FRC teams are located. Are we missing your team? Contact us. To learn more about FRC, visit the FIRST website. FIRST Tech Challenge is designed for high-schoolers who want to compete head to head using a sports model. 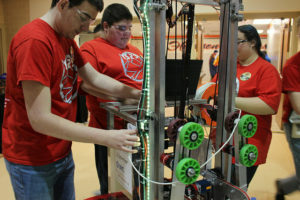 Teams of up to 10 students are responsible for designing, building, and programming their robots to compete on a 12’ X 12’ field in an alliance format against other teams. Robots are built using a TETRIX platform that is reusable from year-to-year using Android technology and JAVA programming. Teams, including coaches, mentors, and volunteers, are required to develop a strategy and build robots based on sound engineering principles. Awards are given for the competition as well as community outreach, design, and other real-world accomplishments. Qualify for over $30 million in college scholarships. To learn more about FIRST Tech Challenge, visit the FIRST website. You can also visit the local Indiana FIRST Tech Challenge website. Engage in team activities guided by FIRST LEGO League Core Values. To learn more about FIRST LEGO League, visit the FIRST website. You can also visit the local Indiana FIRST LEGO League website. 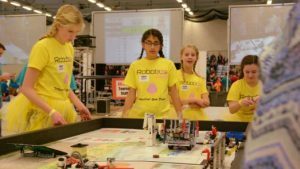 FIRST LEGO League Jr. captures young children’s inherent curiosity and directs it toward discovering the wonders of science and technology. This program features a real-world scientific concept to be explored through research, teamwork, construction, and imagination. Guided by adult coaches, teams use LEGO bricks to build a model that moves and develop a Show-Me poster to illustrate their journey. Learn to incorporate simple machines and mechanical parts into a model to mechanize it. Engage in team activities guided by FIRST LEGO League Jr. Core Values. To learn more about FIRST LEGO League Jr., visit the FIRST website. You can also visit the local Indiana FIRST LEGO League Jr. website.